There are few things in the world that hurt a parent more than hearing their child say “I hate you.” The words cut like a knife. The child you love so much and have sacrificed for in so many ways now hates you. It’s so easy to take this as a personal attack because when we give up so much for someone, we almost always expect good things from them in return. Doesn’t my child understand the sacrifices that I have made for her and that I love her? Your child probably doesn’t feel like he owes you anything for all the great work you do as a parent—most kids don’t. Here’s the truth: your child probably doesn’t feel like he owes you anything for all the great work you do as a parent. Most kids don’t, in part because they perceive the world very differently than we do. Let me be clear: it’s very important to understand that these hurtful words your child is using are not about you at all. When you take it personally, it often leads to a big emotional reaction from you which reinforces the bad behavior. This tells your child that he’s powerful—and has power over you—which helps the behavior continue in the future. After all, who doesn’t want to feel powerful at least once in a while? Kids often spout off hurtful words like these when they have a problem they don’t know how to solve, whether they’re angry, stressed, or dealing with feelings about something bad that happened at school that day. Not being able to handle his problems leads your child to feelings of discomfort—and pushing your buttons and getting a strong emotional reaction from you helps to make up for those feelings of discomfort. Don’t get me wrong, your child isn’t consciously aware of this in most cases. Nevertheless, causing you to be upset helps him to compensate for his inability to handle the problem he’s facing at the time. Some kids also say hurtful things as a means of trying to get what they want. If they can hurt you, you might feel bad or doubt yourself and then give in. So in some cases, it’s a way to achieve a more tangible goal. I think it’s also worth noting that kids often have a lot of faulty thinking that they use to justify their behavior. In other words, they think that if they perceive someone as being mean or if they see something as being unfair, that makes it okay to be hurtful towards the offender. But saying something hurtful in response sends your child the message that you are not in control. It also models ineffective problem solving for your child. In other words, it shows your child that the way to handle verbal attacks is to launch a verbal counterattack. Leave the cursing and name–calling out, too. Two wrongs don’t make a right. Screaming, yelling, or even raising your voice will lead to the same ineffective outcome as saying something hurtful. You will show your child that you are not in control emotionally, that you are his emotional peer. And again, you are modeling ineffective ways to solve problems or conflicts with others. Not to mention, you’re essentially giving up your power to the child. Do you really want to do that? A lot of parents respond to their children by saying something like, “You can’t talk to me that way!” Well, the truth is, they can. You can’t control what words come out of your child’s mouth—that’s something they have complete control over at all times. Others might point out all the things they do for their child to convince him he should be more grateful and respectful. That vast difference in perception between you and your child that I mentioned earlier means there’s a very good chance you won’t be able to get him to see eye–to–eye with you. You’re effectively asking him to get up to a level he just isn’t at right now. As James Lehman says: “Don’t hold your breath… Don’t expect immediate compliance, appreciation, insight, acknowledgment or credit in response to your parenting efforts.” That will come later. Perhaps much later. And when a kid is that upset, he’s not going to be able to really hear what you’re saying, anyway. It’s wasted energy that’s best spent controlling your own emotions instead. It’s very easy for parents to go to that place of, “Fine, if you don’t appreciate anything I do for you or anything you have, then we’ll see how you do without it!” Taking away all of your child’s prized possessions, emptying out his room, or taking things away for weeks or months at a time will not be effective. Over-the-top punishments will not teach your child the skills he needs to manage himself more effectively in the future. It won’t teach him to not say hurtful things to others. Harsh punishments will only teach him to “do time” and will breed resentment towards you. Consequences do not always speak for themselves. You have to step up to the plate and be your child’s coach. Take a deep breath and think about what you will say—and how you’ll say it—before you let the words out of your mouth. Non–verbal cues such as tone, volume, facial expression, body positioning, and the pace of your words are extremely powerful in communication with others. Non–verbal communication or body language can have a huge impact on how your message is interpreted. Try to avoid crossing your arms, putting your hands on your hips, rolling your eyes, or talking at a fast pace, for example. Keep your facial expressions as neutral as possible. It’s a good idea to do a mental check and ask yourself, “How am I coming across right now with my body language?” and make the appropriate adjustments. What you’re doing when you respond like this is effectively and gently challenging your child’s poor behavior and helping him see that it isn’t going to solve his problem, and then you’re redirecting him to the task at hand. The goal here is to be assertive, not aggressive. When your emotions get the best of you, get yourself involved in another activity that will be calming for you. Walking away shows that you are in control and that you have the authority in the situation. 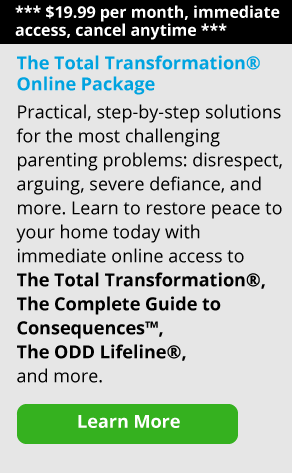 If you’d like, you can come back and address the issue with your child at a later time when things have calmed down, which will be much more effective. After your child has used words as a weapon against you, it’s important to try and follow the suggestions above as best you can. With most kids, staying calm, gently challenging them, and setting clear limits (walking away) is enough to gradually decrease the behavior over time. 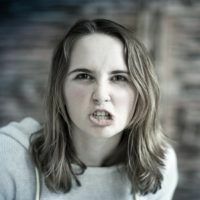 We don’t recommend giving consequences for hurtful statements because when there are so many challenging things going on, it can become really overwhelming to consequence every little verbal outburst. Picking your battles will be very important, as will not giving in to your child and not giving him what he wants when he speaks to you this way. If you feel you must do more to address this issue in your home, you can certainly add some problem–solving discussions once things cool off to help your child develop the skills to solve his problems in a more effective way. Will following these suggestions be easy? No. Will it feel good? Probably not. Will it work? Yes, but it might take some time for both you and your child to make the necessary adjustments. Also, I know that following these suggestions may make you feel that you are letting your child get away with disrespectful behavior. But these suggestions will help you stay in control, role model positive self–management skills, and set clear limits with your kids. Your actions will show that their behavior is not okay. So try your best, stay consistent, and remind yourself that even though it doesn’t always feel good, you’re on the right track.